Experience an intoxicating mix of classical Tribal and new inspirations! Tribal Fusion is open to the personal stylisation of each dancer, playing with styles, energies and influences in daring ways to create a new visual and physical experience every time. Rooted in Tribal Style technique with focus auf healthy posture, clean execution of movement and the contrast between fluid and sharp movements, this style is for the bold and brave individuals who like to challenge themselves and bellydance to eclectic music, from traditional Egyptian folk to intricate dubstep and swift urban styles! Earthy – proud, dignified – cheeky, snakelike – royal. Prepare for swift hips, fluid arms, juicy undulations and fast turns! 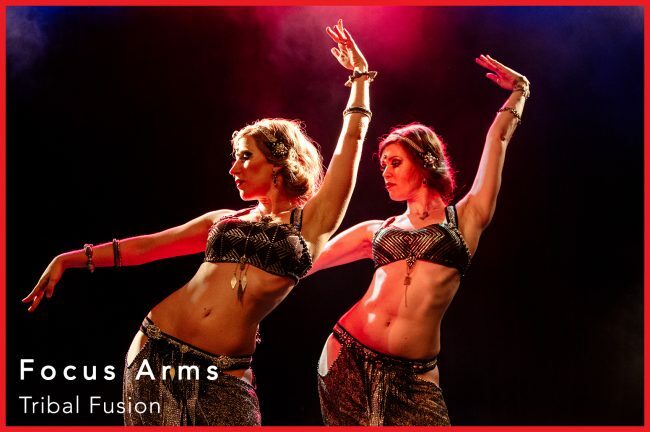 In the Tribal Fusion Focus classes, we will dedicate six weeks to one area of Tribal Fusion technique, learn the correct and clean execution of the movements and work it into combinations to practice in dance. In the Tribal Fusion Choreography we will learn a group piece to be performed at the end of the cycle, either at the Open Stage or at the Student’s Hafla. Level: minimum Tribal Basics required.